Children eating at the IDP site in Mellia, Chad. Chad’s economy is losing 575.8 billion CFA francs ($1.2 billion) per year, or 9.5 per cent of its gross domestic product (GDP), to the effects of childhood undernutrition and resultant increased healthcare costs, additional burdens on the education system and lower productivity by the workforce, a new United Nations-backed study has revealed. 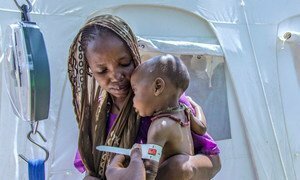 The Cost of Hunger in Africa: the Social and Economic Impact of Child Undernutrition on Chad’s Long-Term Development, (CoCHA) found that more than half of the country’s adults (56.4 per cent) have suffered as a result of childhood stunting. This means that more than 3.4 million people of working age are unable to reach their full potential due to childhood undernutrition. The study equates this lower physical capacity to 63.7 billion CFA worth of loss in economic productivity, as well as 168.6 billion CFA in additional health costs. “Africa, and Chad in particular, has the potential to reap a demographic dividend from a young, educated and skilled workforce,” said Dr. Margaret Agama-Anyetei, Head of the African Union’s Division for Health, Nutrition and Population in a joint news release. COHA is a Pan-African initiative led by the African Union Commission and the NEPAD Planning and Coordinating Agency, through the support of the COHA is a Pan-African initiative led by the African Union Commission and the NEPAD Planning and Coordinating Agency (NPCA), with support from the UN Economic Commission for Africa and the World Food Programme (WFP). The approach was adapted from a model developed by the Economic Commission for Latin America and the Caribbean (ECLAC) with WFP. Today’s report is the ninth to be completed in Africa. Others include Burkina Faso, Egypt, Ethiopia, Ghana, Malawi, Rwanda, Swaziland and Uganda. Studies are also currently under way in the Democratic Republic of Congo, Madagascar, Mali, Mauritania, Mozambique, Lesotho and Zimbabwe. On average, COHA has found that African economies are losing between 1.9 and 16 per cent of their GDP to child undernutrition.To counter this loss and for Chad to achieve sustainable human and economic growth, the report urges that special attention be given to the early stages of life. A lack of measures to combat and eliminate childhood undernutrition will only escalate the country’s costs. “The study provides us with compelling evidence of the consequences of child undernutrition, as well as the justification to increase investment in nutrition and the potential economic returns if we are to take aggressive measures towards eliminating stunting,” said Mary-Ellen McGroarty, Country Director of WFP Chad.